Last week, I received an email from a hunter asking for recommendations on oak species to look for in a West Tennessee bottomland. Among my recommendations was the willow oak. Unfortunately, I didn't have any pictures to point him to at the time since I don't know of any in my home area of middle Tennessee. Last weekend, however, I made a trip to a wetlands area in Northern Alabama that was covered up with willow oaks and another wetland oak species, the water oak. I was able to photograph both trees and will do a separate post on the water oak. 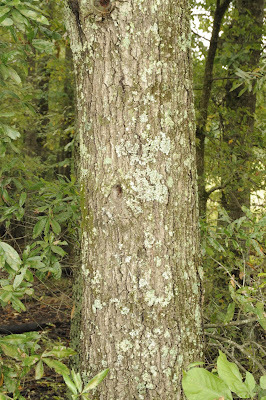 The willow oak is a member of the red oak family. It is a prolific acorn producer capable of generating large mast crops every year (like all red oaks, the nuts take two years to mature). It grows primarily in deep, moist lowland soils near streams and other water sources. The long, spear-tip shaped leaves of the willow oak are easily recognized, although at first glance, they don't look like the traditional oak leaf shape that you are probably accustomed to if you've spent your life hunting upland ridges like I have. 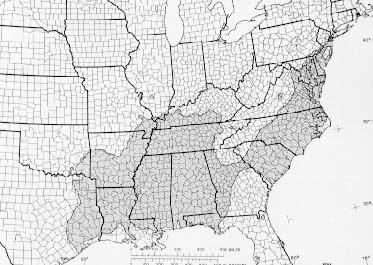 The willow oak can grow to be a very large tree if conditions are favorable. The trunk of the tree pictured above was about 2 feet in diameter and not close to being the largest one in the area. The bark is dark grey with shallow fissures. 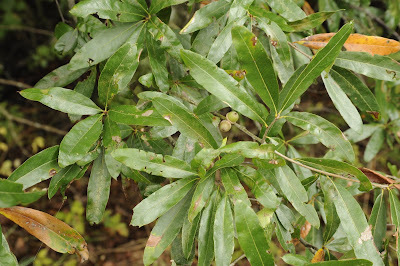 It is not paricularly recognizable, in contrast to the leaves which can be spotted from quite a distance away. 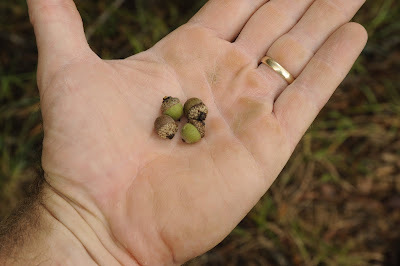 Willow oak acorns are very small, just slightly larger than a pea. They are very round with shallow, flat caps.